SPOKANE, Wash. — With an already record-setting men’s basketball season supposedly at a climax, Hawai’i did itself one better Friday, stunning Cal, 77-66, for the program’s first-ever NCAA Tournament victory. Quincy Smith scored a career-high 19 points and grabbed three rebounds, Roderick Bobbitt added 17 points, seven boards and four assists, and Stefan Jankovic finished with 16 points and five rebounds as the Rainbow Warriors, seeded No. 13 in the South Region, improved to a school record 28-5 and advanced to Sunday’s second-round game against No. 5 seed Maryland (26-8) at 1:10 p.m. (Hawai’i time). Cal, the No. 4 seed, ends its season at 23-11. Sunday’s second-round game will be televised nationally on TBS (Oceanic channels 551 and 1551 in Hawai’i). UH is making its fifth NCAA Tournament appearance and first since 2002; it had lost in all four previous first-round games. 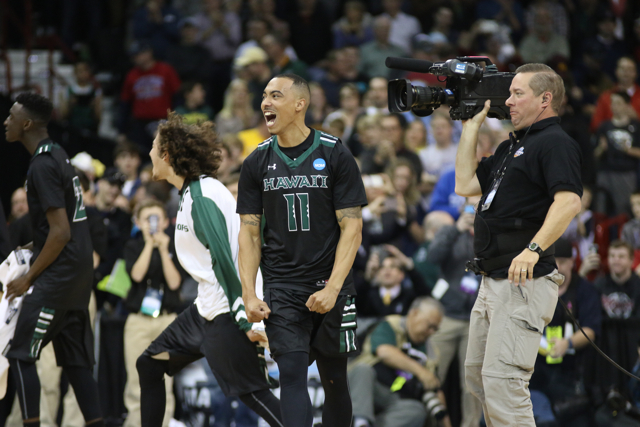 For now, the Rainbow Warriors can enjoy a hard-fought victory over a team that was ranked No. 23 in the latest Associated Press Top 25 poll and regarded as one of the most talented in the nation. A crowd of 11,109 at the Spokane Veterans Memorial Arena — including at least 500 vocal green, black and white-clad UH fans — watched the Rainbow Warriors fall behind in the early moments, take the lead for good midway through the first half and then withstand foul trouble and a couple of threatening runs by the Golden Bears in the second. 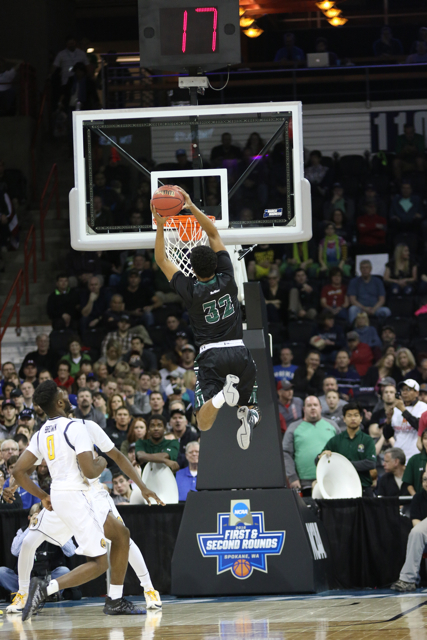 Hawai’i opened up a 47-37 lead five minutes into the second half, but Jankovic also picked up his fourth foul and was sent to the bench by that point. 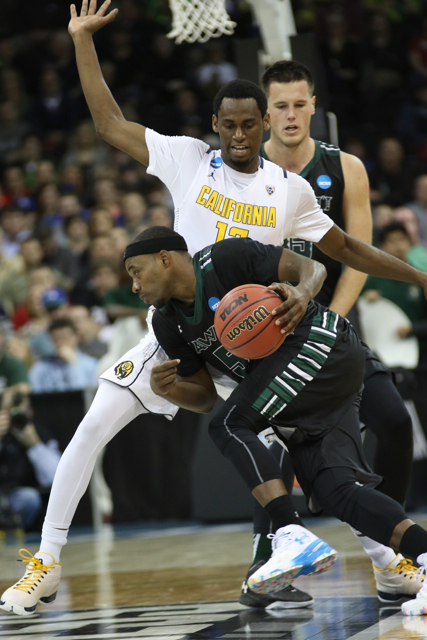 Cal capitalized by responding with a 9-0 run culminating in Kameron Rooks’ three-point play with 11:56 remaining. That prompted a timeout called by Ganot, who used it to give his team one simple-but-clear message. “In the moment sometimes you write on your white board X’s and O’s or something, but in that moment I wrote only one thing — I wrote ‘SOLID,’ ” Ganot said. “We’ve got to be solid, it’s what got us to this point. We were fighting some of our temptations from the past in terms of gambling a bit and not being strong with the ball. That led to some of their transition baskets, we turned it over twice, we took some questionable shots, and you can’t do that at this level at this time. Any good team, which Cal is, will exploit you. So, I’m really proud of how we handled that, because obviously the momentum had shifted. The Rainbow Warriors weathered the storm, later using a 9-2 run to extend the lead to 64-53 on Mike Thomas’ 3-pointer from the top of the key with 6:05 left. The Golden Bears made one more run and got as close as 66-60 on Jordan Matthews’ reverse layup with 3:58, but UH made 11 straight free throws down the stretch to shut the door for good. Hawai’i led 36-30 at halftime, despite early foul trouble and some apparent jitters. But the Rainbow Warriors also got an unexpected break when Cal’s starting shooting guard, Jabari Bird, was a late scratch due to back spasms suffered during pregame warmups. The Golden Bears were already set to play without starting point guard Tyrone Wallace, who broke a bone in his right wrist in Wednesday’s practice. Bobbitt scored the game’s first basket on a runner from the left side, but Cal used an 8-2 run to lead 8-4 after point guard Sam Singer’s layup with 15:50 remaining in the half. The Rainbow Warriors took the lead back at 14-13 on Bobbitt’s floater with 11:40 left, and later stretched it to 27-20 on Smith’s high-arching mid-range jumper with 6:50 remaining. After Smith hit two free throws to make it 29-22 with 6:04 left, the Golden Bears went on an 8-2 run to close it to 31-30 on Ivan Rabb’s putback at the 1:26 mark. Sai Tummala then rattled in a 3-pointer from the right corner with 1:13 remaining, and Bobbitt swished a jumper with 10 seconds left to make it 36-30. Rooks appeared to drop in a layup at the halftime buzzer, which would have cut the deficit to 36-32, but it was waved off after the officials reviewed the play at a courtside TV monitor and ruled the ball was still in his hand when the horn sounded. Jankovic, Smith, Tummala, Jovanovic, Aaron Valdes, and Mike Thomas each drew two fouls in the first half, and Cal was 11 of 16 from the free throw line, compared to 6 of 9 for UH. The Golden Bears also out-rebounded Hawai’i, 18-13, but shot only 39 percent from the field, including 1 for 9 from 3-point range. 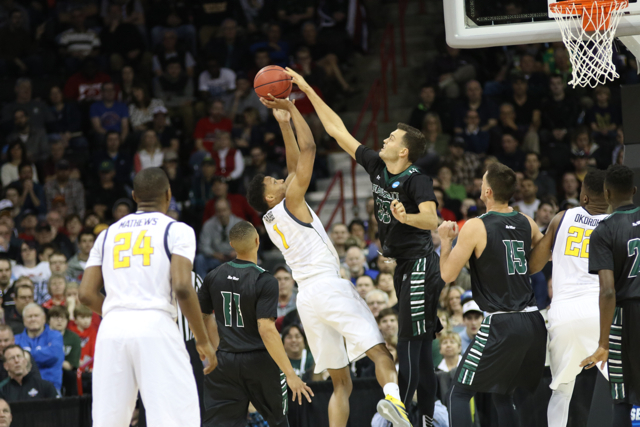 The Rainbow Warriors shot 51.9 percent (14 of 27) from the field. Ganot said he and his staff decided to employ a seldom-used zone defense in the second half, which not only helped UH stay out of foul trouble, but also limited Golden Bear visits to the free throw line (from 16 attempts to 10). Until 15th seed Middle Tennessee State shocked No. 2 Michigan in the Midwest Region later in the day, Hawai’i was the lowest-seeded team to win in the tournament’s first two rounds of action. But when asked how it felt to “bust everybody’s bracket,” Jankovic feigned confusion. “Well, I think Obama’s bracket is still intact,” he said, referring to the President predicting the upset while filling out his bracket on ESPN Wednesday. When asked if Hawai’i is a “Cinderella team,” Valdes also had mixed thoughts. So proud of this team. I always felt Quincy could score around twenty points a game if he hit his freethrows and he had 19 today. Was also happy to see both Stephan’s in the game at the same time. I think it helped us control the boards. Go Bows! Great article. It truly “exposes” Ganot as a great coach, as much as he likes to push all the credit on the kids. Going to the zone and the fact that they had actually spent some time working on it, for example. Also, although I noted earlier how frustrated I was at how long it took him to call the timeout during that stretch…he identified the exact problem and he’s basically able to communicate it to the team with one word. They know, they just have to be reminded (call the timeout sooner next time!). Several commentators have mentioned his calm demeanor and I agree that the team mirrors this and it IS their greatest asset. Congratulations Coach. This team could not have done it without you. Sunday’s game against Maryland is scheduled to start at 1:10 p.m. (Hawai’i time), and it will be televised on TBS. Kelley O, I notice that about Ganot. He doesn’t seem to call time outs early to stop the other team’s runs. Maybe he doesn’t believe in that strategy or he needs to figure out what his team needs to do before calling one. I haven’t been tracking it but I wonder how many time outs we usually have at the end of the game. If we’re using it all, I guess Ganot’s managing them well. Brown is doubtful as a lottery pick, per Bobby C the other day, due to his performance in the Pac12 tournament. Wow! Northern Iowa upsets Texas 75-72 on a half-court shot at the buzzer. You can see Q,s confidence on his free throws. I noticed he made a slight change before the Big Weat tournament and now he’s found the groove. He’s now about 2 to 3 inches behind the line and he’s more free to shoot the ball. You can just see it in his approach and demeanor. I’m so proud of him. If you watch the post game press conference, big props to Cal coach Cuonzo Martin for his humility and the credit he gives to Hawaii and not making any excuses (and he could have made a LOT of excuses), as well as the two Cal players for their maturity and attitudes. It was especially refreshing after watching Tom Izzo crying over his loss and letting his player then take the loss on his shoulders like it was the end of his life or something, followed by Charles Barkley crying about never winning a championship! Waaah! The maturity of the Cal players, knowing it’s just one game, no excuses, life has adversity, it doesn’t take away from a great season compared to Michigan State! Wow!!! Go Warriors – we can do it again on Sunday !! I like Charles Barkley. He’s funny, and he’s a character. But, more often than not his predictions are totally wrong. He picks based on reputation and he doesn’t study the teams very well especially the mid-majors. So, I hope Chuck picks Maryland to beat Hawaii and I’ll be very happy. And I’m looking forward to that game. Maryland has a 5 star player named Rasheed Sulaimon, a former Duke player. In an AAU game when he was a senior in high school he played former Rainbow Warrior Manroop Clair. In that game Manroop took Sulaimom to the woodshed for 26 points and was trash talking him something like you can’t guard me. It was all over the Internet. So we’ll see how Sulaimon does against us. At 6’6″ SG he pretty good, but I hope Q, Rod, or Valdes can do a good job against him. It’s going to be interesting. Sulaimon played here in the Iolani Classic, went to Duke and started as a freshman and sophomore, then got kicked off the team last year, apparently the first time ever that Coach K had dismissed a player. Found a second chance at Maryland though I’m not sure how well he’s been playing. Today, he scored 7 points in 36 minutes. Some highlights of Maryland vs S Dakota St. They can shoot the threes. Shooting 37.5 % on 3’s for the season. They shot 89 % for FT’s vs. S Dakota St. It takes awhile for the highlights to load. Watched a little of all opening round games. No joke. Hawaii can beat them all. They will beat Maryland like Cal. Reason? Superior senior guard play. And one team one win thought. Maryland once they take warriors lightly they will find themselves 12 points down 2nd half..and lose…Really happy Quincy Smith for past 3 head coaching staffs. They love his heart energy. Senior Q we will miss him. One of best to ever play for Hawaii! Ever notice Melo Trimble when he takes a 3. He likes to take it at the top of of circle right in the middle. I hope coach Ganot and the coaches know his tendency. And since he’s a lefty he favors his left side and drives that side most of the time. Any edge we can get. Trimble and Sulaimon are both very experienced four year players. They can both get hot and fill it up from the outside– this will be toughest backcourt we’ll have faced this year. Maryland also starts two 6’9″ forwards in Layman and Carter. Layman is a very good 3pt shooter, so I guess Valdes will cover him. The undersized SDST team got one less rebound than Maryland in their game, so I’m not too worried about being physically outmanned. The one advantage we have is Janks in the post against Diamond Stone. 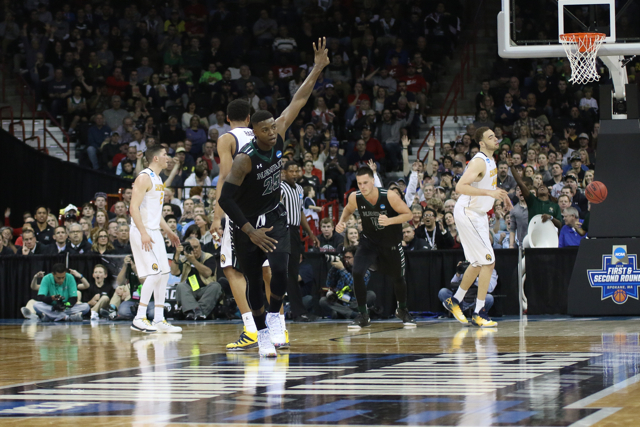 Ivan Rabb is way more polished on both sides of the ball than Stone, and he couldn’t stop Janks from having his way. I’ve been reading a lot that Maryland is very inconsistent on offense. We will need Q and Rod to lead the defensive pressure once again. Oh, and Janks, please stay on the court for 30+ minutes this game! I like this matchup and I think it’ll come down to the wire. Good to see Jack and Jakob in the 2nd video above at about 3:25. In the below UH video at about 4:25 you see Eran getting a drenching. at about 3:30 of the video. **typo as Trimble is a sophomore. And I know Jakob doesn’t travel with the team, but Howcome he’s not suiting up or on the bench if he’s there? Trimble is a soph, per the roster, Diamond is a frosh,Carter a junior, Nickens, a soph. Cal did not play well but same could be said about Hawaii. If Bobbitt gets his shot working along with Valdes peaking at the right time we will beat Maryland. I don’t think anyone in college can stop Janks. He is his worst nightmare due to constant foul trouble. On the days he is not in foul trouble he really dominates the inside on offense. Most of the analysts were stunned that so many underdogs won. One station posted an image of an analyst as a girl in a bikini and it read come to Hawaii after UH beat Cal. Sulaimon at .440 has a slightly better 3 pt FG % than Layman at .419 but Layman has a better overall FG %. Bows make it to sweet 16 legitimate national title contenders! No matter what barkley says! Madness!! Foul trouble. I don’t like it. Can’t take Maryland lightly. They are big. And they are ranked 18th as compared to Cal having been ranked 23rd. Got to focus. One game at a time. Please calm down. Maryland is of HIGH basketball pedigree. 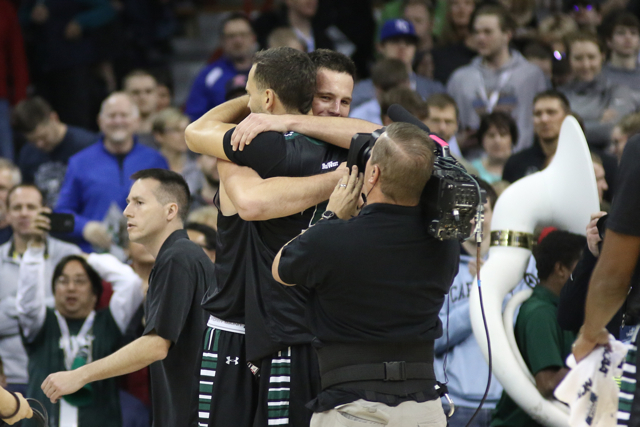 They’ve had multiple NBA players come their way, a national championship a few years ago, tons of high level experience this season… and now, they have VIDEO on Hawaii. Please do not get everyone’s hopes up on this board. Please stay humble, like our players. The more you predict our victory, the more likely you’ll jinx our team. Besides, NOW you’re singing the praises of Coach Ganot. What if we lose this next game, will you start dumping on him again? Just a few weeks ago, you went on the other network to blast him by agreeing with a disgruntled poster on the Star Advertiser. Don’t think we all forgot about that. Next time, be careful what you post. People don’t forget. Respect everyone, fear no one. Anything can happen, amazing things happen in the NCAA tournament. Just have to play well on the days you play. This Hawaii team has good karma and Coach Ganott is so calm. Quiet confidence, I like that. 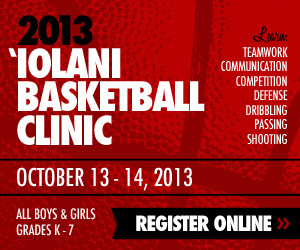 There is no panic, just play basketball. Prove our President wrong. What is up with the NCAA highlights, 80% of it is Cal highlights. Where is the love for Hawaii? Hoping he and the rest of the team get a lot of rest and as always, leave everything on the court tomorrow. I know they can do it, but even if they don’t I’m still immensely proud of this team. What a memorable season and it ain’t over yet. First Day of Spring…The ‘Bows! After watching the Maryland – SDSU game, I think we can play with them but it’s going to be tougher to deal with them than Cal. At point they have Melo Trimble who is a projected 2nd round talent right now. He’s got an NBA body, but he looked a bit too reckless with his shot selection. He also didn’t shoot it particularly great and missed a couple 3’s badly. It’ll be a great matchup against Bobbitt who I think matches up well with Trimble. At SG they have Rasheed sulaimon, a duke transfer. He’s insanely quick, but so is Quincy. He’s got some size on Q (6’4″), but I like the matchup overall. Their small forward (Layman) lit up SDSU. He’s 6’9″ and can stroke it from deep. Also looked to be able to put the ball on the floor and I think he also plays the 4 at times. Also projected to be a possible 2nd round pick. Valdes will have to stay out of foul trouble because I think he’s the only guard/forward we have with enough size to adequately contest Layman’s shot. Their bigs are where I’m most concerned. They have three (stone, carter, dodd) that look like men amongst boys in terms of their stature. All are at least 6’9″ but built like D-linemen. Ive seen a mock of stone as a mid first rounder and carter will also get looks in the 2nd. Where I think we might be able to exploit a weakness is they didn’t seem comfortable guarding the perimeter as SDSU bigs routinely got good 3pt looks, but just couldn’t make them. We need both Sai and Janks to get hot from deep. Boxing out will be critical. And of course, staying out of foul trouble, but at this point in the year I think we just need to accept we always will be in foul trouble hah. All that said, I don’t think they’ll run us out of the gym. They’ve also struggled of late, playing roughly .500 ball in the past 10ish games. Their fans don’t seem to be giving us much respect, so I hope their team does the same and overlooks the Warriors. Go Bows!! Early score: Wahine 11, UCLA 10. Great game Players really excited and ready for next game Players parents said Jakob and Jack paid there own way Jakob sitting with parents with Jack Both boys giving it all from the stands Coaches should be ashamed of themselves. Players want them with them and Jakob is now 13th player and meant to travel according to parents!